reflexology | beauty massage | waxing | manicure | pedicure. We were a Little Shop but we had a big heart. We did nails, facials, reflexology, beauty massage and waxing. Our customers are so important to us. Little Bird Nail Salon had been open since 2007 until 2015. You would of met Jackie and the girls. We offered full Nail Salon services, Chinese Beauty Massage, Chinese Foot Reflexology, Chinese Spa Facial and Galvanic Spa Facial. Our floor space in Hampton Bays had doubled in 2014. We have opened the door to the attached shop next door for additional beauty massage and foot reflexology space. Little Bird expanded in 2013, having opened Little Bird Healing Spa in Southampton focusing on being the first authentic Chinese reflexology, facials, beauty massage and waxing in the Village. Little Bird expanded again in 2015, and opened Little Bird Spa : Your friends from Little Bird have launched another location, this time in East Hampton. 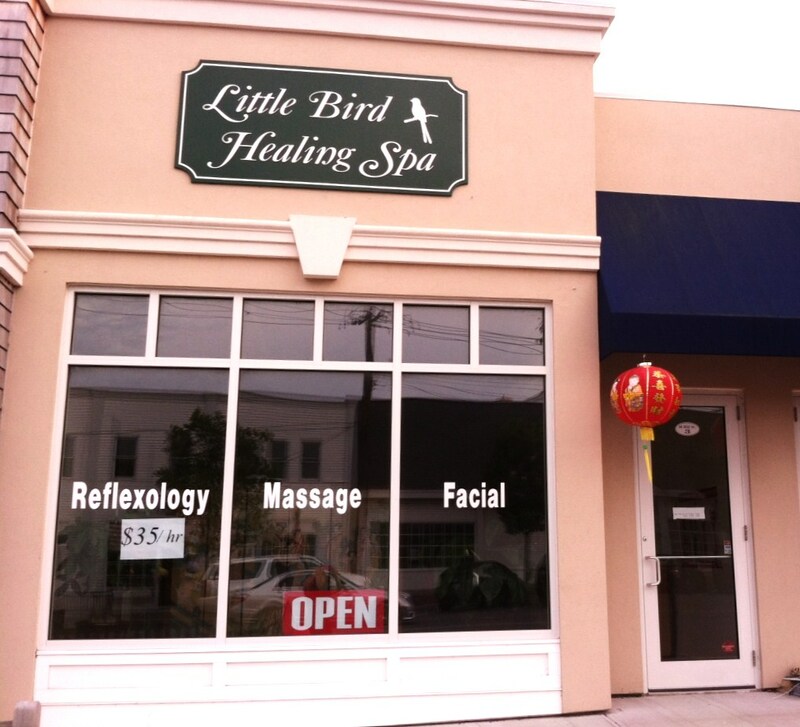 Little Bird Spa opened on March 29th 2014. Little Bird Spa's focus is on Chinese facials, galvanic facials, foot reflexology, foot rub massage, waxing and body beauty massage. Little Bird made a change once more in 2015 by making a presence further east. Little Bird Spa East Hampton is offering Foot Reflexology, body beauty massage, Chinese facials and Galvanic facials and waxing. We have the highest standard of cleanliness in our shops. You will feel comfortable and safe every moment you are with us. Also, men, couples and families are welcome. We have memberships available enabling members to receive free services. With over 500 members we have given thousands of dollars of free facials already. Come in an ask for details and benefit information. We are licensed in all services that we perform and continually train for more advanced techniques. We offer private parking in the center of the busy Hampton Bays area for our customers. Parking is in the rear of the building, in designated spots. We are trained by the International Institute of Reflexology. Little Bird Spa East Hampton provides personal service in Foot Reflexology, Chinese facials, Galvanic Spa facials, Beauty Massage and Waxing. Little Bird Healing Spa in Southampton provides personal services which are Reflexology, traditional Chinese facials, Galvanic Spa facials (uses Nu Skin ageLOC products), Beauty Massages and Waxing. This new location will be joining Little Bird Nail Salon and Little Bird Healing Spa in performing authentic Chinese Reflexology, traditional Chinese facials, galvanic spa facials, beauty massages and foot rubs.